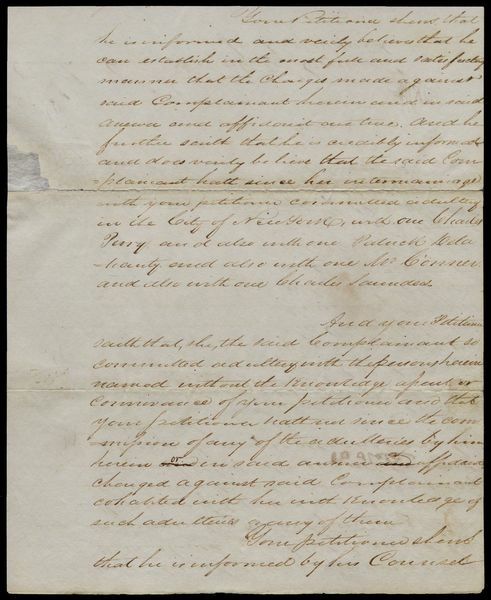 Summary of Content: Also signed by Charles O'Conner, Solicitor of Counsel for Burr. Certifies that the adultery charges against Burr's second wife, Eliza Jumel, can be proven. States that Mrs. Burr has committed adultery in the city of New York with Charles Perry, Patrick Delahanty, Mr. Conner, and Charles Saunders. Background Information: In 1833, Burr married his second wife, the widow of Stephen Jumel. She realized her fortune was dwindling from Burr's land speculation and they separated after only four months. She sued ...for divorce which was granted the day he died, 14 September 1836.